to the right of the station. 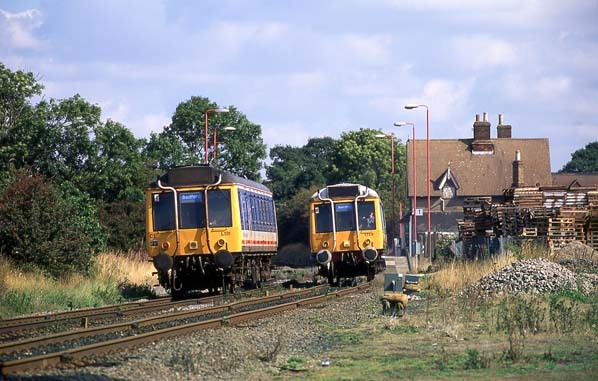 The hourly servicea in each direction on the Bedford - Bletchley line meet at Ridgmont station in September 1995. 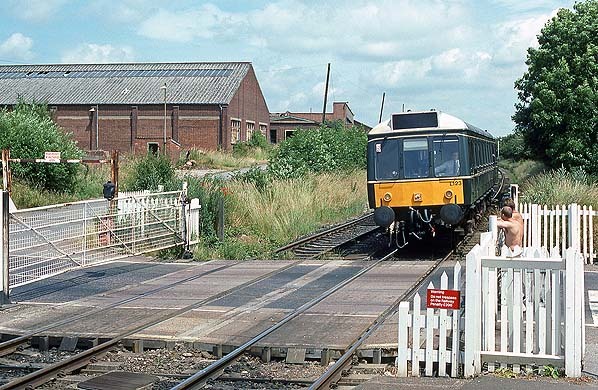 Two class 121 DMU single-unit 'Bubble cars' are seen: L131 is on the 11.50 from Bletchley and L129 is on the 11.40 from Bedford. 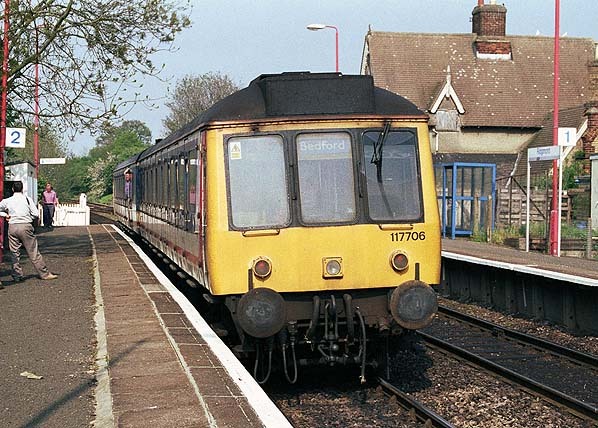 A 2-car class 117 DMU bound for Bedord is seen in the down platform at Ridgmont station in 1999. 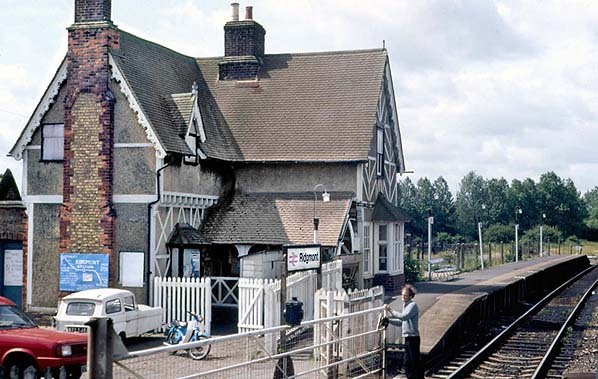 The original down waiting room is still in use but a ‘bus shelter’ has appeared on the up platform. The line is now part of Network SouthEast which has brought further new signage and new high level lighting. Under Network SouthEast the platforms were given numbers. 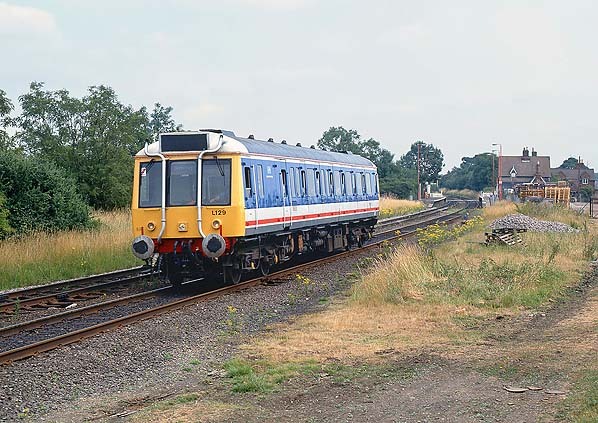 Class 121 single-unit 'Bubble car' L123 arrives at Ridgmont forming the 12.40 Bedford - Bletchley service in July 2003. 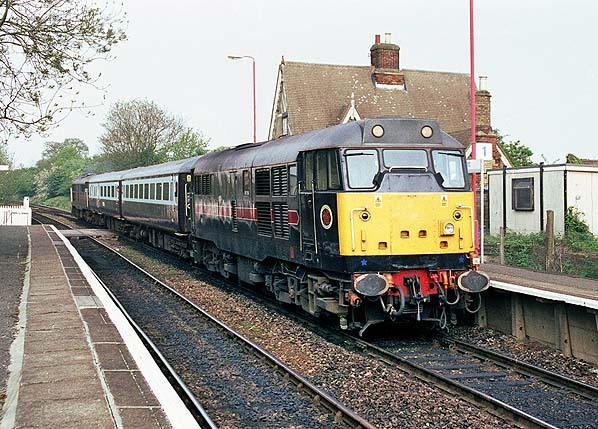 This unit was repainted in BR green livery whilst based at Bletchley depot and, after further repainting, to its original livery and number (W55023). It can now be seen on the Chinnor & Princes Risborough Railway. The derelict buildings of the Ridgmont brickworks are seen on the left. 46233 ‘Duchess of Sutherland’ at Ridgmont station with PMR Tours 'The London Explorer'' on 20 October 2012. The tour ran from Sheffield to Euston and back to Derby, with the 'Duchess' taking over at Nuneaton on the outward journey. 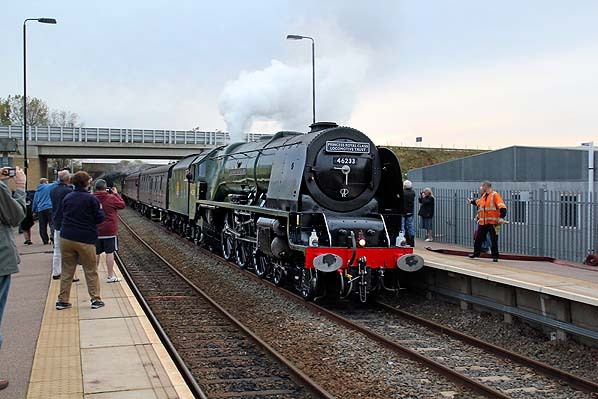 On 11 June 2002 the restored Duchess was the first steam locomotive to haul the Royal Train for 35 years, transporting Queen Elizabeth II on a tour to North Wales, from Holyhead to Llandudno Junction, as part of her Golden Jubilee. The trip also marked the 160th anniversary of the first Royal train in 1842. 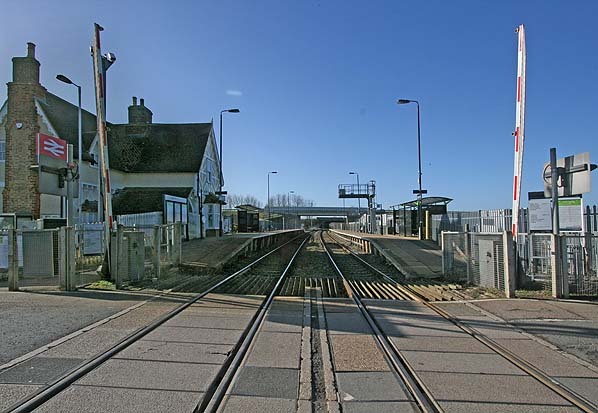 Ridgmont station looking south-west from the Station Road level crossing in February 2014. The original waiting room has now been demolished and replaced with another ‘bus shelter’. 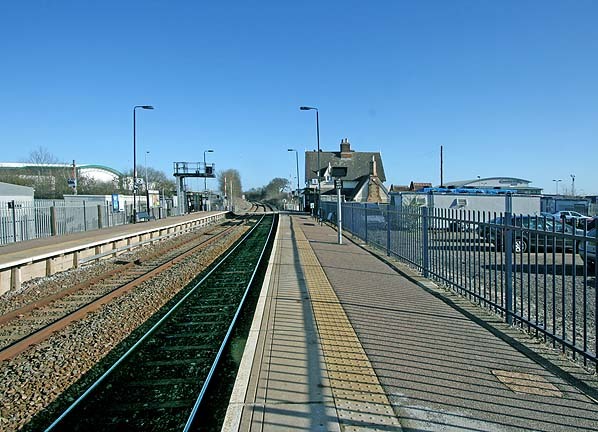 Ridgmont station looking north-east from the down platform in February 2014. The Silverlink Trains bus shelter on the up platform has been replaced with a longer one. 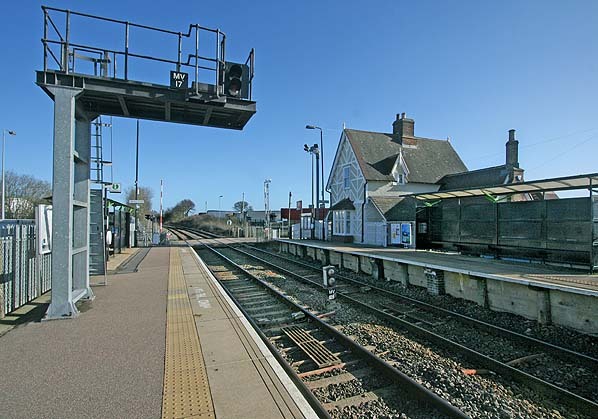 A particularly ugly signal gantry dominates the platform. 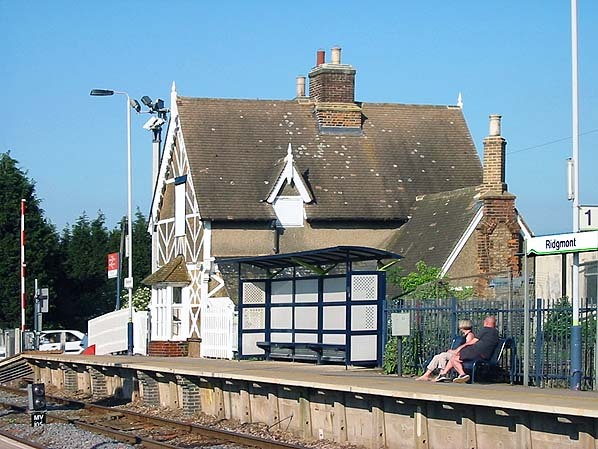 A new signalling control centre was built at Ridgmont as part of the Bedford - Bletchley route modernisation in 2004. 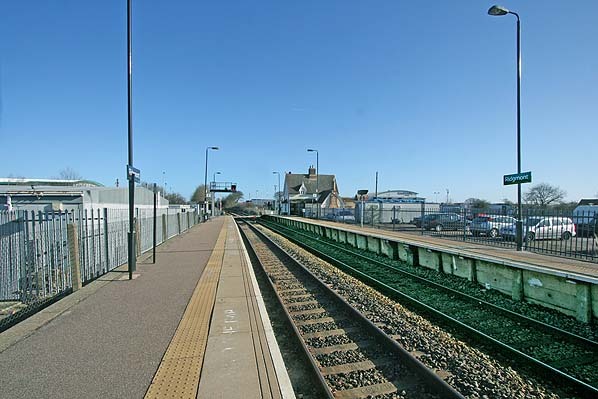 Ridgmont station looking north-east from the down platform in February 2014. Once again a change of operator to London Midland has brought new signage. Ridgmont station looking north-east from the up platform in February 2014. The former goods yard is seen on the right, a small section of the loading dock is still in place to the left of the portacabins.